Oh my, you lost me at knitting... hehe:) I do love them but I would have to have hands on lessons. Thanks for sharing the pattern, I will pass it on to knitters I know. Have a blessed day! Super cute and soooo cozy! Yea...aahhh~I think I will stays with those easy things like scarves and baby blankets! Really cute! These are GREAT! I might even try my hand at this pattern... maybe. All that sewing together frightens me haha. Very cool...now I'm trying to figure out how to do this in crochet. Thanks for the inspiration! And by the way, I love Eric Maisel's books, I've found them very helpful. Thank you for posting this pattern. My late Grandmother used to make these for us when we were growing up. Now I can make some for my family! One question-can you please explain how to do the rib? Thanks. Oops! Never mind. I read your instructions again and found it - DUH- my bad! Thanks for sharing this pattern! 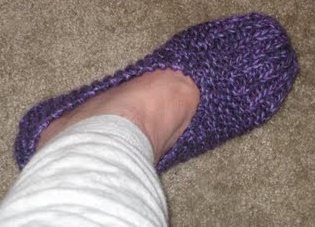 I learned to knit from one of my dear aunts by making this exact slipper pattern ohhh so many years ago. Me too, Maureen. I need to make some more. Love them. When you shape the toe and say to 'Rib 7 stitches, SKP, K1, K2TOG, Rib 5, SKP, K1, K2TOG. Rib to end of row', how do I know if I am to begin with a knit or purl on the rib 5 portion of that row? Or where I need to rib to the end of the row, do I begin with a knit or purl? Sorry for the hassle, my great grandmother used to make these for my grandmother and the final pair she has are wearing out. I'd like to make her a new pair very soon. Thanks! I made a pair last night while I was watching television. I love them and I will be making another pair tomorrow. Yay! Thank you! I made these for my little girl and she absolutely loves them. It's so great that I can make something for her when I just started learning to knit about a month ago. Thank you so much for posting this! Great pattern. Thanks for sharing it! I'm going to give it a go! This pattern has been around at least 50 years! It is fast,cozy, cute, or handsome. We added a pom pom ball for girls when it made the gift show circuits. It is even more sturdy w/ 3 strands. It one of the all time favs... txs for featuring it here. You're welcome, Robynne. Thanks for your kind words. A family friend taught me to knit years ago; these slippers were my first project. My granddaughter (5) wanted slippers last week and when I looked for a pattern on the Internet, couldn't find one I liked. So I did this one from memory, only I cast on 23 stitches and did K7, P1,K7, P1, K7. I made up the decrease at the end, but they came out fine. I'd drawn around Grace's feet so I'd know how long to make them. I knitted a pair of these a few weeks ago and I added a crochet edge around the top, but after a while they became to loose so I threaded some hat elastic around each one and now they stay on perfect. Thank you for this pattern! It was super easy to follow and I can't stop making these great little booties!! Thanks so much for this pattern. I have been looking for this. I'm a new knitter, but I want to knit these for x-mas gifts in honor of my mother who could only knit these slippers. Thanks again. Thanks for posting this pattern. I have just started to knit and was looking for an easy pattern. I think this looks like something I can try. Thank u for the pattern!! !may I have the permission to translate that in Greek for my blog??? My mother made these for my sisters and me for years. Can't even begin to count how many she made for us to give as gifts to teachers and friends!!!! Everyone just loved them. So excited to have found the instructions so I can make some. THANKS!!! Thank you for these! Just made a pair. I like how the back is easy (instead of casting on incrementally). This is what I am looking for, but I need a pattern in a toddler, 4 year old size, for my budding ballerina. Can anyone help please? Can you provide guidance on sizes? I want to knit a man's size 11 (US). I am wearing a pair of these right now. They were knitted by my paternal grandmother over 40 years ago. Thank you for the pattern! When you say "Ending on a wrong side row"...Do you mean you knit that wrong side row, then end? I'm having trouble understanding the back seam. Sorry. Do I simply fold cast on edge wrong sides together and stitch? A photo or vid would be so helpful. Thank you! I have to agree with the previous post. I just can't seem to understand the heel seam. Up till then, everything was very clear. I'd love to finish these. Can anyone help? Thank you!! Thanks for the super pattern! However I an having prblems with the heal seam too....any suggestions please? Desperate to make some for the family for Xmas. Thank you for posting this. I knit my husband a pair 30 years ago. I started a pair for him (Men's size 9) last night. However, I would start the ribbing at 3" below the toe as it looks kinda funky at 2". For those who need it, do 41 rows garter stitch then start ribbing for 3 inches then finish. Now, I can use up my stash! Great pattern, it's like childhood memories! One thing I'm not sure about-- which is the right side and which is the wrong side? Thank you! Almost done with a really pretty pair. Thank you so much for posting this pattern. My family has been making these all my life. The version I have is just like yours, but it also has the variations for children and men's sizes as well. I'll be glad to share it with you if you are interested.